The efforts at SeaChar (Seattle Biochar Initiative) produced a 5-gallon (22-liter) TLUD. "On Saturday, August 1, Seachar hosted Dr. Paul Anderson (Dr. TLUD) for an all-day workshop in the construction of Top-Lit Up Draft (TLUD) cookstoves. The stoves can quickly be constructed from commonly available materials, and produce charcoal while providing heat for cooking (or other uses). Paul’s TLUD stoves have been tested and shown to produce very low emissions of CO and particulates. The stoves can provide benefits wherever people rely on biomass for cooking. TLUD stoves use a wide variety of small pieces of biomass for fuel. The clean burn greatly improves indoor air quality compared with open burning and many other types of stoves. In addition, the charcoal can be used as biochar to improve soil fertility, sequester carbon, and potentially provide a source of income through carbon credits." The focus was for making biochar, but this size of TLUD will be highly appropriate of institutional-size cookstoves in the developing countries. 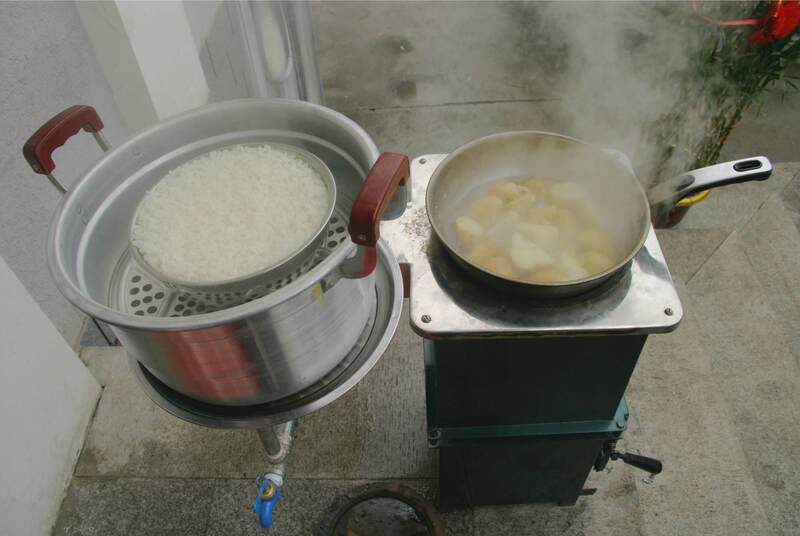 “Air-controlled” biomass cookstoves should be seriously examined as viable replacements for charcoal cookstoves in urban and peri-urban communities in developing societies. 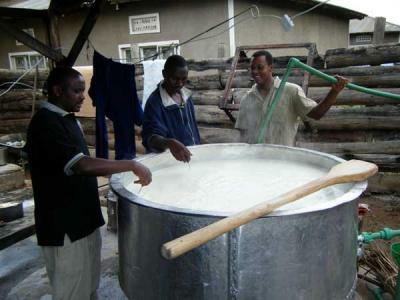 residential cooking (including other small-scale cooking in restaurants and institutions). The acceptable energy sources for urban cooking are charcoal, LPG, kerosene, alcohol, and electricity. (Solar cooking is omitted because of housing densities and shadows.) All of them require significant “conversion” from their natural sources, and are deemed to be sufficiently clean energy, meaning a “lack of bothersome smoke” or very low emissions of particulate matter (PM). Charcoal competes well against those other high-order heat sources because it is easily and relatively inexpensively made from wood and other dry biomass by unskilled labor. But charcoal has two major drawbacks: A) very high levels of carbon monoxide (CO) emission; and B) the destruction of local vegetation from which the charcoal is made. Therefore, it is important to examine viable alternatives such as modern cookstoves that efficiently combust raw dry biomass such as wood which yields CO and PM emissions (“smoke”) even lower than those of charcoal stoves. If these new stoves are successful, task-appropriate, and sustainable for urban cooking, they will also significantly reduce the problems of deforestation and greenhouse gases while providing urban residents with economical and convenient fuel alternatives. 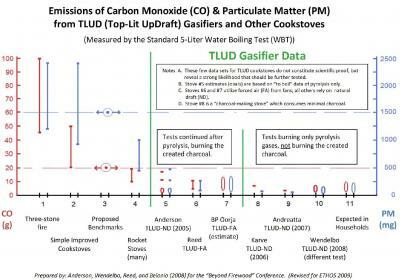 The document attached contains detailed instructions for the construction of Anderson’s "Champion-2008" top-lit updraft (TLUD) gasifier that can be used in many different cookstove structures. On 18 pages with 39 Figures, the “Champ” is described in three versions (Hobbyist, Refugee and Artisan) with the same dimensions but using different materials and metal-working skills. I enjoyed (and benefited from) the 2009 ETHOS Conference more than in most previous years. ETHOS is growing and evolving, and so are our stoves. This year we seemed to have had more discussions of issues than in the past. There were topical “panels” of usually three or four qualified people. The topics of these plenary sessions were: Carbon Credits; Stove Testing Issues (not results of specific stoves); Safety; and Stove Standards. Those sessions still tended to be presentations, but there was somewhat more interaction and some effort to get to the underlying difficulties that need more discussion. Attendees still need to read-between-the-lines and/or have some more private discussions to see some of the differences of position. There were still about 30 somewhat standard (academic style) presentations, usually with PowerPoint slides. But they were in three concurrent sessions with 30 minutes (too much in my opinion) allocated to each presenter (who usually did make sure to fill all of the minutes, often with background info that could have been omitted, in my opinion). So each attendee could only hear about 10 of them. I will comment on four of the nine that I was able to attend. There were certainly other excellent presentations, but I am not trying to summarize the entire conference. 1. Alan Berick did a masterful job of calling attention to simmering by the use of only charcoal, available from the fire that was used to bring the pot to boil. There were questions about the heat retained in a ceramic stove body, etc., and certainly he will do more work on this. But really he called attention to the need to have “different” heat sources for boiling and simmering. This is akin to the advocacy of retained heat cookers (RHC or “hayboxes”) for integrated cooking. We should all think more about having two or more modes or devices for different cooking (as in bringing-to-boiling vs. simmering vs. tea-for-two in the morning). 4. Nathaniel “Nat” Mulcahy attended ETHOS for the first time and (in my opinion) presented the most dramatic stove innovation I have seen since the day I met Tom Reed and his TLUD prototype. Nat presented about the Lucia Stove (and some info about the larger WorldStove). True science and engineering in action. His website is underdeveloped, but he has 13 YouTube items that will partially bring you up to speed. Visit: www.youtube.com/worldstove I will be writing more in another message about his “coaxial gasification” (vs. stratified gasification in TLUDs and most other small gasifiers). I spent some extra time with Nat and can say that he has deep understanding of the issues, and he has solutions already in place. The “Lighting of the Stoves” was Sunday afternoon, with a light snowfall!! Five stoves were fired up. 1. 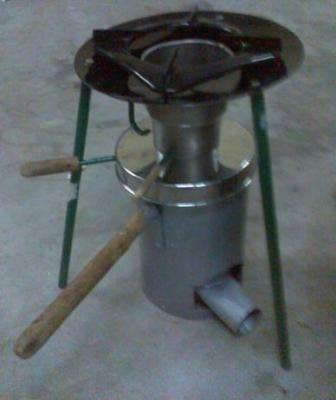 The Rocket stove produced in China. Reliable, economical, and this one had a very nice pot-skirt that attached to the pot and let the emissions/draft out through (20 mm??) holes near the top of the skirt. Many people (including me) purchased one of those stoves (and would like to get the skirt). Contact Aprovecho to get your stove (under US$30, plus shipping). 2. The “PP-Plus” natural draft TLUD from Servals in Chennai, India. It uses the natural draft techniques combined by Paul Anderson and Paal Wendelbo. I will be posting within a few days a document on how to make a PP-Plus gasifier. 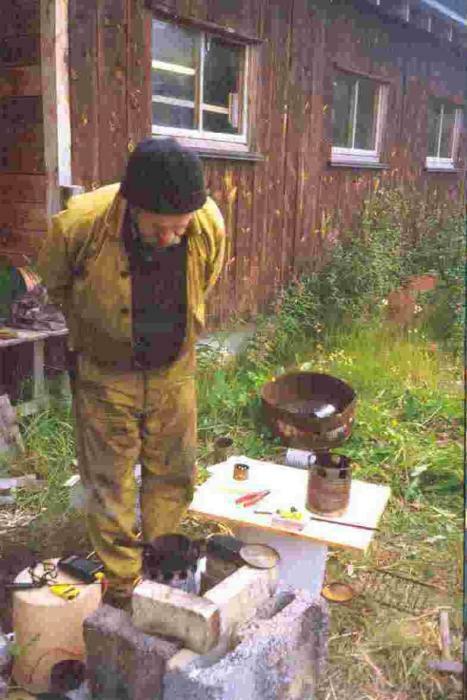 (Wendelbo’s extremely interesting life as a TLUD pioneer was highlighted at the Friday night slide-show and is at the Stoves Website: http://www.bioenergylists.org/wendelbopekope ). 3. The GEK downdraft gasifier. This is not a cookstove. It is a gasifier intended as a start-up kit for aspiring gasifier enthusiasts, including cleaning and cooling of the gases. This is for sale as a kit or as a set of plans for construction. About forty units are around the world. 4. The Lucia Stove by Nat Mulcahy. Mentioned previously. The live-fire demo was impressive. The turbulence of the gases/flame and the air control provided a very clean combustion, measured by Crispin and his furnace-emissions analyzer. 5. The BioLight by Drummond and Cedar. Discussed previously. It performed very well, and was measured by Crispin to have very clean combustion slightly better than the other four stoves shown this year. As someone mentioned, in previous years usually only one gasifier was among the stoves ignited. But this year four of the five were gasifiers, each distinctly different from the others. The “Crispin Awards” were inaugurated this year. Crispin gave out three little bottles of “Gold Medal” Canadian pure maple syrup to stoves 3, 4, and 5 in the above list. The criteria were the emissions readings from his furnace emissions analysis equipment. The three winners did share one thing in common. All three were with force air, and even used true blowers, not just small fans.